The Five Obstructions is a two-man circle-jerk. 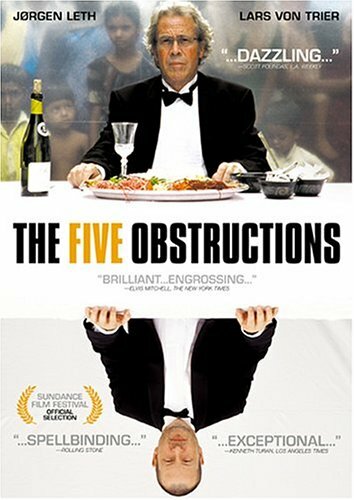 As with everything from von Trier (even down to the "von" added to his name) The Five Obstructions is a very pretentious ordeal. Two pioneering film makers sit around discussing how awesome they are, and challenge each other to run laps around the block, making the same short film 5 times. With each lap, a new obstruction is put forth, forcing creativity to emerge. The Five Obstructions is not so much a feature film, as a series of experiments with the film format, and the outcome is something only true film connoisseurs will enjoy.